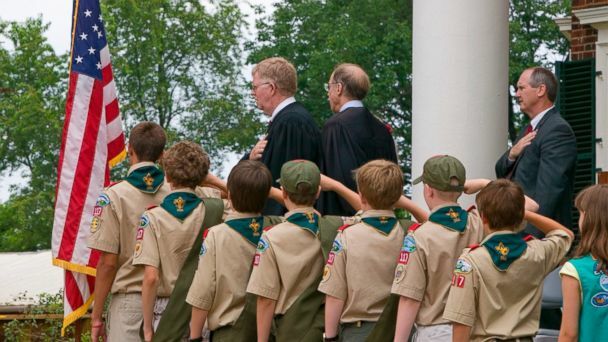 A landmark change for the Boy Scouts of America is scheduled to take place this Wednesday, when a new policy allowing gay scouts goes into effect. The Boy Scouts' policy toward gay members and gay leaders has brought controversy to the organization for years. It voted earlier this year to allow gay members, but not gay leaders. The organization has put in place some rules along with the new policy, such as the ban on scouts using their Boy Scout uniform to promote political causes, which will include gay scouts promoting gay political causes. The BSA declined to answer questions about the implementation of the policy today, but released a statement that said there would be a "smooth transition to the new membership policy," and expected "no major changes to the delivery of the Scouting program." "While people have different opinions about this policy, we can all agree that kids are better off when they are in Scouting," the statement said. Scouts for Equality, a group that fought to pressure the BSA to include gay scouts, said today that it will now focus its efforts on the inclusion of gay leaders. Zach Wahls, a co-founder of the group and outspoken son of a lesbian couple, said the group will continue its work until scouting is a fully-inclusive family activity. "Opening membership to gay youth is an historic first step toward full equality in the BSA, but we're not there yet," Wahls said. "Scouts for Equality will continue to advocate for a fully inclusive membership policy, to help build a stronger, more inclusive Boy Scouts of America." Wahls pointed out in the statement that gay scouts will be excluded from their troops once they turn 18, even after they have achieved the highest honor in scouting, the Eagle Scout Award. Brad Haddock, an executive board member of the BSA, told the Associated Press that the scouts are hoping the transition will happen seamlessly, noting that many churches and religious groups have said they will continue to support the BSA. "My hope is there will be the same effect this Jan. 1 as the Y2K scare," Haddock told the AP, referring to the feared computer havoc that never materialized in the year 2000. "It's business as usual, nothing happens and we move forward."